I thought My recipe for Otong soup would be my last with Okra, but this very recipe had to happen. It is one of those combination recipes that just beautifully happens. A lot of people eat Okra and and the Nigerian stew together, but actually cooking them together is something I have not really seen to be popular. Anyway, I had some Nigerian tomato stew and some okra and I was not sure about what to do with it and I do not believe in throwing food away, so I decided to defrost some meat and make some soup. Like I always say, I like accidental recipes; it just works wonders. I am never over thinking anything during such accidents and I go with the flow. With this recipe, you really have to trust me. It was gone within a day and a half and of course the table was quiet; which goes to show you that everyone enjoyed their hot plate of Okra soup. 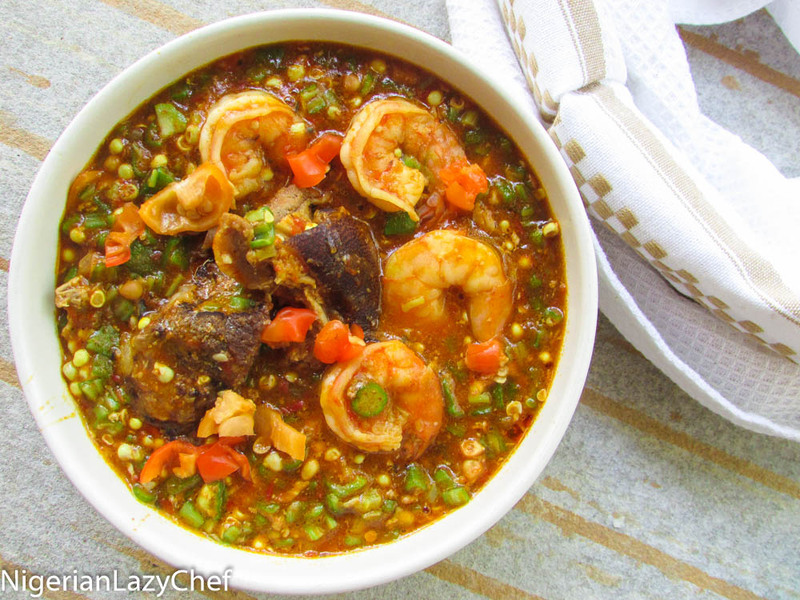 If you eat okra and stew; then this is the recipe for you! I promise you, you will lick your lips and fingers and eat seconds 🙂 I promise this recipe is easy and time saving. If ‘Okro’ soup hungry you, and you no get the time nor the energy to run around the kitchen; then this recipe na for you. It is quick, easy and tastes simply delicious! If you do not have tomato stew, the process to making one is easy. Simply blend some tomatoes, red bell peppers, onions and some habaneros(ata-rodo). Heat up some oil, chop in some onions, sauté and pour in the tomatoes. Season and cook until the tomatoes has reduced and the oil has floated to the top. This entry was posted in Eating Healthy, Healthy Eating, Healthy Nigerian, Healthy Nigerian Dishes, Meat dishes, Meat stew, Nigerian sauces, Nigerian soups, Nigerian Stew, Nigerian stews, Okra soup, Peppersoup, Side dishes, Sides, Soups, stew, Stews, Swallow, Uncategorized and tagged illa asepo recipe, Nigerian food blog, Nigerian food recipe, Nigerian okra soup recipe, okra recipe, Okra soup recipe, Okra stew recipe, Okro soup recipe, stewed okra recipe. Giving this a try . My kids love anything okro and the pic looks so inviting . Thanks for the recipe. Great recipe. Please is the baking powder a thickener? If not, what is it for? Just made this..I love it!! Just went through some of your recipes and gosh! They are wonderful. Love you girl. More feathers to your cap. Awww Usman. Thank you very much. Plenty love too! I loved it. Nma pls wia are u based? hav u eva considered establishing a school 4 ur fellow lazies! Sooooooooo interested .